Our article entitled "Characterisation and comparison of bacterial communities on reverse osmosis membranes of a full-scale desalination plant by bacterial 16S rRNA gene metabarcoding" was published in the journal npj Biofilms and Microbiomes. Given the very high standards of editorial and peer review process, and the diversity of topics related to biofilms and microbiomes, the journal was an excellent platform to publish this novel study about biofouling in desalination membranes. I discuss the work behind the paper below. Bacterial communities consisting of numerous species, and their biofilms on membrane surfaces used in engineered systems are an area of increasing research interest recently. ‘Biofouling’ is the term used when membrane biofilms become detrimental to the operation of the system such as, seawater reverse osmosis (RO) desalination plants. Biofouling in desalination plants is estimated to incur losses of 15 billion US$ per annum, to the industry worldwide1. Due to the difficulty of access to membranes in full-scale operational plants, the understanding of biofilm communities on desalination membranes was previously, restricted to bench-scale studies, pilot-scale experiments or short studies (<1 year) in full-scale systems. By contrast, this study investigated RO membranes at the end of their operational life (>7 years). Inferences of what could be happening on the membranes over their functional lifespan were drawn from results of this study. 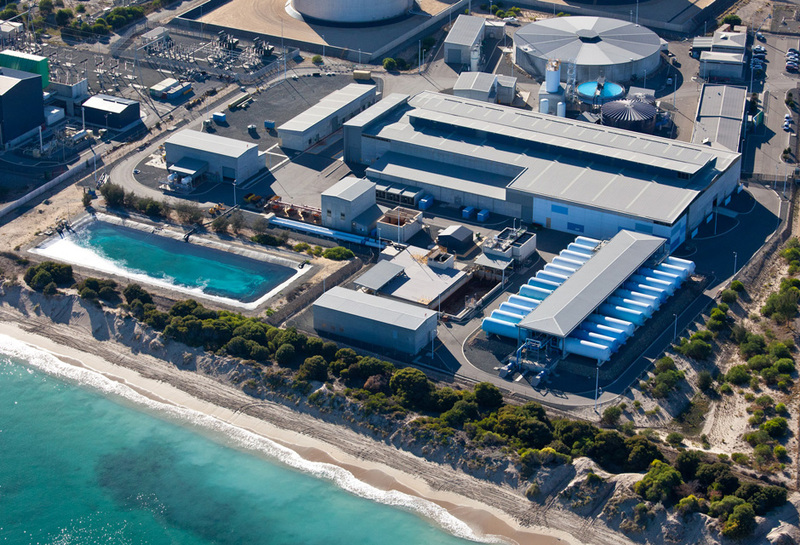 During my PhD programme, an exciting opportunity came up, when the Perth Seawater Desalination Plant was replacing all their RO membrane units with new ones. 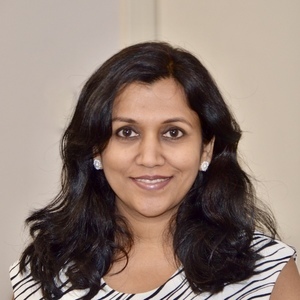 This was one-of-a-kind chance to perform an in-depth characterisation and community analysis of biofilms on membranes, which had undergone a complete operational lifecycle of seven years! Furthermore, findings of this paper could lay a solid foundation to the rest of the chapters of my thesis entitled ‘Investigation and control of biofouling in seawater reverse osmosis desalination membranes by bacteria and their extracellular polysaccharides’. Dr. Lucy Skillman, my supervisor proposed the study relevant to the paper. Along with Mr. Rob Vollprecht from the ProAlliance Joint Venture, membrane samples were collected from various rack locations and of different fouling severity. Membrane units were autopsied by cutting them open to reveal the membrane sheets, which were used for genetic profiling studies, microscopy and other chemical analyses. 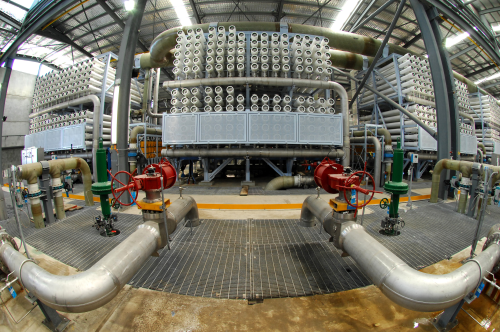 The RO membrane system at work in the Perth Seawater Desalination Plant. The unused membranes, which were factory-tested and waiting to be installed in the plant, were used as a critical benchmark for comparison to fouled membranes and this was yet another factor that was novel in this study. It was a difficult task to classify the vast range of membranes based on different criteria. As part of the study, a comparison was made between membranes from top and bottom racks. The rack position did not influence the community structure significantly, and the biofilms were similar in membranes from top and bottom racks. However, these results were not presented in the paper, due to space constraints. The most important parameters that could influence the structure of biofilms and their community composition were selected as 1) severity of fouling, and 2) location of membrane sampling along the course of the RO units. 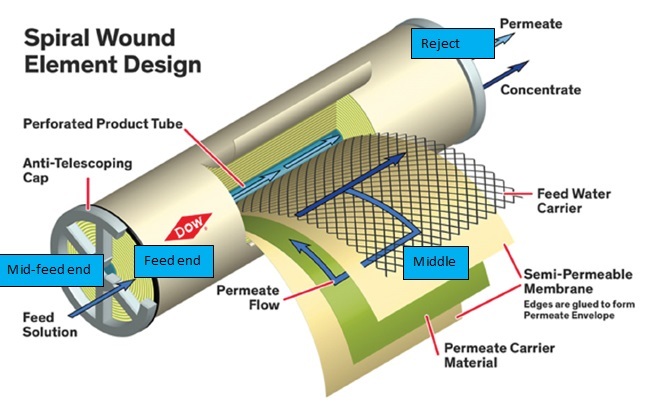 *Graphic of spiral wound element courtesy of Dow. The sampling locations are indicated in blue. Following the sampling and classification, confocal laser scanning microscopy of membrane biofilms was carried out in the State Agricultural Biotechnology Centre (SABC) at Murdoch University. In parallel, DNA extractions were done and next-generation-sequencing (NGS) performed under the guidance of Mr. Alex Gofton. The facility in SABC, Murdoch University, was used for sequencing. Alex’s contribution was invaluable in the analysis of NGS data. It was, no doubt, exciting to obtain an enormous amount of information from the NGS analysis about the bacterial groups and their abundance in individual membrane samples. But now, came the most challenging stage of the study - how to interpret this information? What does this mean in the context of role of these bacteria in biofouling? What is the relation between the bacterial community composition and the biofilm structure? How different or similar are these communities between different groups of membranes? How do the conditions within the desalination plant, such as, high pressure, salinity or shear force affect the community structure in different parts of the membrane units or in membranes of varying fouling severity? There were several challenging questions indeed to be analysed in order to understand the adaptation of bacteria to the conditions of the desalination plant. It took me about two months to extensively study literature about the basic physiological and morphological features of the predominant bacterial groups, and relate it to the NGS data; and as I analysed the community composition in detail, it was like putting several pieces of a puzzle together to form a bigger picture! It was indeed rewarding to discover how the facts unfolded, to tell a story about the entire biofilm community existing as one entity. The major bacterial groups clearly appeared to complement each other, rather than compete for resources, such as, nutrients and oxygen. For example, the thinnest and the most compact biofilms comprising mainly primary colonisers occupied the mid-feed region of the membranes, where a high shear force may be expected to wash away the superficial top layers of the biofilm. Likewise, thicker biofilms corresponded to a higher proportion of secondary colonisers in the middle region of membranes where shear force, and oxygen supply is expected to be lower. Despite multiple prefiltration steps and rigorous chemical treatments, biofouling is a major threat to membranes. Scientists are trying to find answers on how the bacteria gain access to RO membranes at such a rapid rate. Control of pre-existing bacterial communities on membrane surfaces is something that needs a lot of attention to mitigate fouling. The defining feature of our study was of course, the characterisation of the bacterial community on fresh unused membranes, which hosted a majority of nitrate-and nitrite-reducing bacteria, corresponding to the seawater community flora. Literature also suggests that many oligotrophic marine microbes adapt to a low nutrient source, by shrinking in size to a cell volume <0.1 μm3 - also known as ‘ultramicrobacteria’, which can easily pass through microfilters 2. These include many marine sphingomonads 3,4 and some Pseudomonas strains5, which were abundant and appeared to play a critical role in membrane fouling according to our study. Due to their high surface-to-volume ratio, they have a higher metabolic activity than larger bacterial cells and are able to utilise the organic sources of carbon in seawater more efficiently and can penetrate 0.2µM filters. As they reach the RO membrane surface, the higher nutrient availability may enable them to actively proliferate and form the primary base layer of the biofilms. As I said earlier, the outcome of findings presented in this paper has led to further discoveries about extracellular polysaccharides produced by the key bacterial species 6 in the biofilm community, methods of alleviation of fouling on these membranes by polysaccharide-degrading compounds 7 and exploring the possibility of biological control methods 8. As we find more answers about the key biofouling groups of bacteria, possibilities of finding better solutions to the problem of biofouling are higher. 1 Azis, P. A., Al-Tisan, I. & Sasikumar, N. Biofouling potential and environmental factors of seawater at a desalination plant intake. Desalination 135, 69-82 (2001). 2 Schut, F., Prins, R. A. & Gottschal, J. C. Oligotrophy and pelagic marine bacteria: facts and fiction. Aquatic Microbial Ecology 12, 177-202 (1997). 3 Williams, T. J., Ertan, H., Ting, L. & Cavicchioli, R. Carbon and nitrogen substrate utilization in the marine bacterium Sphingopyxis alaskensis strain RB2256. ISME J 3, 1036-1052 (2009). 4 Cavicchioli, R., Fegatella, F., Ostrowski, M., Eguchi, M. & Gottschal, J. Sphingomonads from marine environments. Journal of industrial microbiology & biotechnology 23, 268-272 (1999). 5 Colwell, R. R. & Grimes, D. J. Nonculturable microorganisms in the environment. (ASM press, 2000). 6 Nagaraj, V. et al. Characterisation of extracellular polysaccharides from bacteria isolated from a full-scale desalination plant. Desalination 418, 9-18 (2017). 7 Nagaraja, N. et al. Investigation of compounds that degrade biofilm polysaccharides on reverse osmosis membranes from a full scale desalination plant to alleviate biofouling. Desalination 403, 88-96 (2017). 8 Nagaraj, V., Skillman, L., Li, D., Xie, Z. & Ho, G. Control of biofouling by xanthine oxidase on seawater reverse osmosis membranes from a desalination plant: enzyme production and screening of bacterial isolates from the full-scale plant. Letters in Applied Microbiology 65, 73-81, doi:10.1111/lam.12747 (2017).